By Billy Ludt | March 9, 2018 at 12:00a.m. Photo by Robert K. Yosay | Justin Culp, left, and fellow freshman Kegan Wormley pose for a photo with their NASA Mars Rover Project submission. 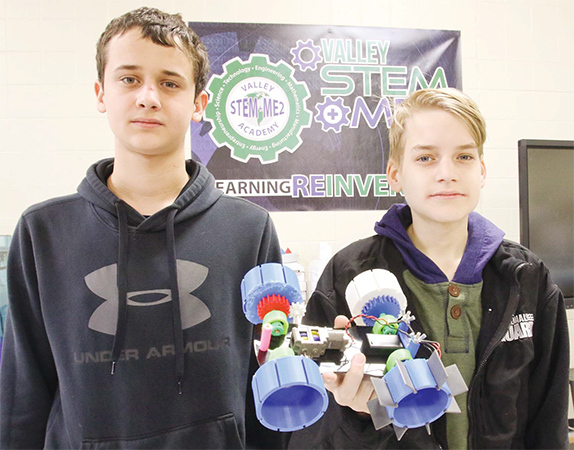 The two Valley STEM Academy students were the sole team at the academy to advance. Some students believe that the solution to navigating the surface of Mars is found floating here on Earth. Participating schools were tasked with developing wheels better-suited for the red planet’s surface. Each group received rover model kits in November, and were required to design and make 3-D printed wheels. They sent their models through rounds of tests on simulated terrains, and returned to the drawing board to try again. The wheels on Culp and Wormley’s rover submission specifically look a lot like the paddles on a steam-powered riverboat. The rotating paddles were built to push boats through the current, but freshmen Wormley and Culp thought of another use. “Our thinking for it was, it would be able to dig into the sand and climb over objects,” Wormley said. They printed wheels with space for oars to recreate the riverboat paddles. The design helped them make it to the next round of the project. NASA design engineer Steve Bauman told students during a question-and-answer session in November that the space program lacked anybody with experience engineering tires. This has resulted in rovers with faulty wheels roaming a planet 34 million miles from Earth. Wormley said he’s excited for the next step of the project. The two will go to NASA Glenn Research Center in Cleveland to show their findings and meet with space program employees. March 8, 2018 9:55 p.m.